Surety1 is based in beautiful Rancho Cordova, California, where we have been helping businesses and individuals with their surety bond needs since 2003. 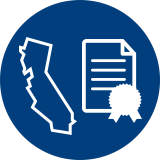 The process for obtaining a bond over $400k in California is a bit more rigorous, but our strength is in helping you obtain approval and walking you through the process every step of the way. Our team takes pride in placing surety bonds for clients with challenging requests. Placing California performance and payment bonds over $400k are our specialities. Because of our extensive contacts with 15 different markets, we are able to provide contractors and janitorial and security companies with competitive rates. Surety1 is able to leverage our connections for fair underwriting terms. We will work with you to place your performance or payment bond, even when your credit history has impacted your attempts to obtain a bond in the past. Surety1 is dedicated to helping you grow surety capital. Surety1 has built such a strong reputation that we have significant in-house authority to approve your performance and payment bonds. We have the resources to expedite your approval. Our time sensitive process means you can be approved within hours instead of days or even weeks.